You didn’t think I was doing this blog just for yucks, did you? No, I’m in it for the bucks. Ideally, this is a showcase for my writing in the hopes it might lead to paid writing gigs. And that’s exactly what happened. Hopefully, I will be doing monthly features on Bay Area bands for the news page of 101 Distribution, an independent music and film distributor. To launch things off, I set up an interview with Picture Atlantic. I’ve been listening to the San Jose alternative rock band a lot lately, ever since discovering them through a listener/reader poll of Top 10 Local Bands conducted by KITS-FM (105.3). Most of the bands I heard weren’t that memorable, but Picture Atlantic kept finding its way into my playlists. Silicon Valley’s garages are more likely to house tech start-ups than upstart rock bands, but Picture Atlantic is doing its best to show that the region is capable of producing more than just 30-year-old billionaires. 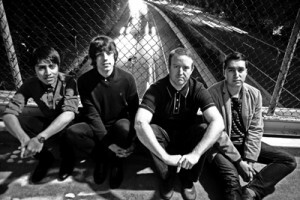 The Bay Area group was named Best Local Band by readers of San Jose alternative newspaper MetroActive in its 2011 Best of Silicon Valley issue. It’s not the alternative rock band’s first electoral victory. In 2008 Picture Atlantic’s fans helped vote the band into a gig opening for Coldplay at the HP Pavilion at San Jose. Singer and guitarist Nik Bartunek understands if you are skeptical of the value of such popularity contests. He’s skeptical of them, too. Seriously click on the link, so that they’re convinced it’s worth it to continue paying me to produce content. This entry was posted in Bay Area Music, Linkage, Local Bands, Music and tagged 101 Distribution, alternative rock, Linkage, local bands, Picture Atlantic. Bookmark the permalink. Ha ha! It's Burl, everyone!